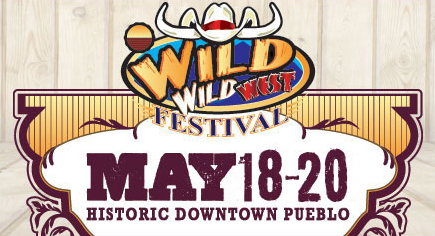 The Professional Bull Riders, Greater Pueblo Chamber of Commerce, and the community of Pueblo will host the 4th annual Wild Wild West Festival, May 18-20, 2012. The western themed festival will feature events for the whole family ranging from concerts to carnival rides. The festival weekend will be highlighted by the Pueblo Invitational Built Ford Tough Series Event scheduled for Friday- Sunday May 18-20 at the Colorado State Fairgrounds Events Center. Tickets are on sale now for the Pueblo Invitational at www.ticketmaster.com. The festival will be held throughout the Pueblo community with the majority of the events centered on the Riverwalk and the Union Avenue Historic District. Events throughout the 3-day festival will be hosted by community non–profit organizations and the Wild Wild West Festival Committee. Some of the events you can participate in include the PBR Fan Zone, live entertainment, carnival rides, street vendors, and much more! The City of Pueblo, Pueblo Cares and Pueblo Wastewater Department are offering Pueblo city and county residents the ability to get rid of their garbage, May 22, 2010 at the Colorado State Fairgrounds from 8:00 – 1:00pm. Their will be a $5 entrance fee per vehicle. For more information you can call the Pueblo Recycle Hotline at 719-583-4924. The list of items that you can drop off are.